Do you love the ocean, wildlife, science, or history? This is the place for you! We're looking for volunteer education program instructors to teach hands-on education lessons for K-12 students. 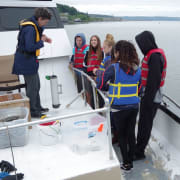 We provide programs on a variety of subjects including history, marine science, and environmental science. We run on-shore programs at the Foss Waterway Seaport museum and boat-based programs out on Commencement Bay. Programs are regularly scheduled for Monday-Thursday from 8:00am at the earliest to 3:00pm at the latest. Other opportunities are available outside of these regularly scheduled school programs. Some examples include social media, aquarium maintenance, or curriculum development. Willingness to learn new things, especially science! If interested, please contact us at education@fosswaterwayseaport.org to learn more!